But the nails are cute. And omg don't even remind me of William's bald spot. It just breaks my heart...he used to be so very delicious. You are so talented! 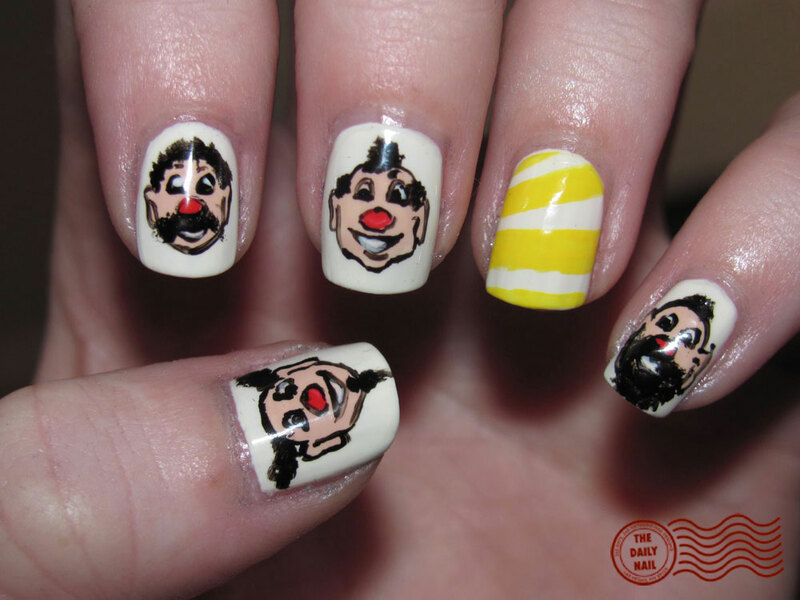 How long does it take for you to do these nails? i remember having one of these and loved it. I had so much fun with this toy! You did a great job replicating it. As always...UH-MAZING! You deserve an exhibit in a gallery for these works of art! Oh man, LOVE these nails, it brings back my childhood! Hahahahaha! I used to give him sunglasses or a top hat! This blog is amazing! Nails are awesome!! this website is sooo awesome! i never know what to do with my nails and i get sooo tired of just 1 color. i love your designs! Ha-ha. This is too cute. this excellent website is definitely sooo brilliant! we can't say for sure how to handle the finger nails and i also obtain sooo fed up with just 1 coloration. i love a person's layouts! I love this design and copied it for my own Easter mani this year. I would have had a really hard time figuring out the shading without your example. It received tons of compliments and I posted shots on Facebook and made sure to give you credit. Thanks!